A bone spur, also know as osteophyte, is a projection of a bone (bony projection) that develops and grows along the edge of joints. Bone spurs are fairly common in people over the age of 60. It is not the bone spur itself that is the real problem, but the pain and inflammation which begin to occur when the bone spur rubs against nerves and bones. Bone spurs can affect several parts of the body, but the most common parts affected by bone spurs are the neck (cervical spine), low back (lumbar spine), shoulder, hip, knee, and heel. There are a number of common spinal conditions related to the development of spinal bone spurs such as osteoarthritis, cervical radiculopathy, lumbar radiculopathy, and spinal stenosis. 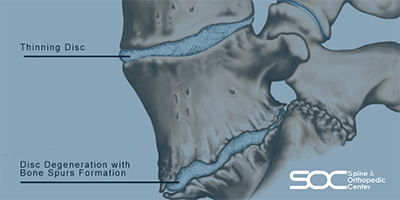 Our specialists at Spine & Orthopedic Center offer careful diagnosis and treatment options for spinal bone spurs. Schedule a visit at any of our offices in Boca Raton, Deerfield Beach, Coral Springs and Plantation. As we age, the discs in our spine naturally degenerate and lose some of their natural shock-absorbing (defensive) ability. Common factors that contribute to this process include stress, injury, poor posture, poor nutrition, and family history.